Medium-sized thrush with short bill and short legs. The male is uniformly black with a yellow beak and eye ring while the body of the female is brownish, with small, lighter-coloured specks on the breast and with a dark bill. Spends most of the time on the ground near cover, feeding. Its flight is usually low and quick, swooping into cover. The habitat of the Blackbird ranges from forest to urban areas and includes farmlands, gardens and high-altitude vegetation. The only type of habitat where this species does not occur is in areas of no vegetation. A very common bird throughout the island of Madeira, but with not many individuals on Porto Santo. 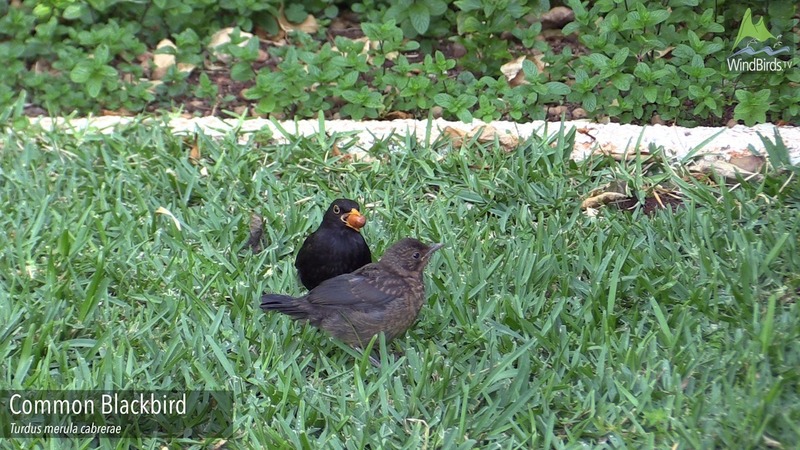 The Blackbird of Madeira and Porto Santo differs from its congener by being darker and smaller, and as it is also found also in the Canary Islands it is, therefore, an endemic subspecies of Macaronesia. Breeding: On a grass and mud cup base with twigs as structure, built low in vegetation, 3 to 5 eggs are generally laid on each of up to 4 broods between March and August, though the season varies with altitude, as breeding occurs later at higher altitudes. Diet: Feeds on worms, insects and invertebrates of all kind in the ground and on berries and fruits in bushes.